(Bloomberg) – If this 83-year-old billionaire is right, one of the most important lessons of business school is pretty much wrong. All that stuff about focusing on shareholders? Forget it, says Kazuo Inamori, entrepreneur, management guru and Buddhist priest. Spend your time making staff happy instead. He’s used this philosophy to establish electronics giant Kyocera Corp. more than five decades ago, create the US$64 billion (S$91 billion) phone carrier now known as KDDI Corp., and rescue Japan Airlines Co. from its 2010 bankruptcy. It’s a view that carries weight because of Inamori’s success. KDDI and Kyocera have a combined market value of about US$82 billion (S$116.6 billion). When Inamori was named chief executive of Japan Airlines in 2010, he was 77 and had no experience in the industry. The next year, he returned the carrier to profit and led it out of bankruptcy. In 2012, he relisted it on the Tokyo stock exchange. 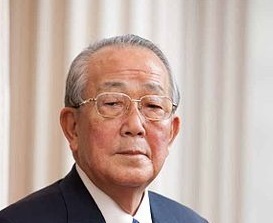 The companies Inamori has led are connected by more than their management approach. Kyocera was the largest shareholder in KDDI as of Sept. 30 with 13.7 per cent of voting rights, according to the phone company’s website. The stake is worth US$8.2 billion (S$11.7 billion), almost half of Kyocera’s market value. Kyocera owns 2.1 per cent of Japan Airlines, data compiled by Bloomberg show. Hong Kong-based Oasis Management is calling on the electronic equipment-maker to return cash to investors by selling its stake in the airline and “greatly” reducing holdings of KDDI. Kyocera’s shares have risen 48 per cent since Abe’s government took power in 2012, compared with an 84 per cent gain for the benchmark Topix index. Return on equity, a measure of the profit companies make from shareholders’ capital, stood at 5.8 per cent at the end of September, against an average of 8.6 per cent for the Topix.